A paper written about air and water pollution. The human race has been able to accomplish many feats as it evolves and adapts to the surroundings and ever changing environment. Some look at the changing environment as something that is uncontrolled or cannot be effected by the actions taken by human. From the standpoint of science there are many observed changes that take place on a daily basis including the exponential release of pollutions into the atmosphere and waterways. Explosive growth of algae in waterways due to excess phosphorus and other nutrients from runoff of fields sprayed with chicken bedding and compost as well as higher levels of greenhouse gases in the atmosphere have shown to affect the world that the human race lives in. The industrialized nations of the world are producing many items of convenience and have been at a rate that exceeds the demand. The increase in goods production has put a stronger pull on the infrastructure of these countries. In the United States, as estimated by RITA, had a total of 250,272,812 highway vehicles registered in 2010 (RITA, 2012). Production consumes energy, in turn more energy is needed to produce and maintain these vehicles. Production of parts, assembling, maintaining, and repairing all put more strain on the power gird increasing the need to burn more fossil fuels. As the amount of fossil fuels consumed increases so does the pollution which is the byproduct of the choice to live at a higher standard. Carbon dioxide, nitrogen oxides, and sulfur dioxide are all byproducts of consuming fossil fuels and are the major contributors to global warming, the observed changed that humans are having on the earth. These three gases are all primary sources of air pollutants but once in the atmosphere they are likely to react and form secondary pollutants (The Habitable Planet, 2012). When nitrogen oxides mix with hydrocarbons the resulting gas is ozone. In the higher atmosphere Ozone protects the earth from the harmful radiation of the sun but at lower elevations it has a chance to raise air temperatures and cause respiratory track issues. One of the most effective ways that some of these byproducts have been mitigated is by the addition of catalytic converters to all modern vehicles. The catalytic converter is used to convert excess hydrocarbons that made it past the combustion cycle into steam and carbon dioxide. This additional piece of equipment was put into place due to new regulations passed by the government to help reduce the about of emissions released by automobiles. Although the amounts of nitrogen oxides and residual hydrocarbons have been reduced the amount of carbon dioxide has increased. Higher concentrations of carbon dioxide are trapping the energy from the sun causing the surface of the earth to warm. Warmer surface temperatures cause larger and more frequent forest fires as well as melting of the polar ice caps, ice shields, and glaciers. This increase in carbon dioxide has had and is still having a lasting effect on the air and waterways. The amount of carbon dioxide in the atmosphere will have a direct relation to the amount of carbon dioxide in any given waterway as the gases in the atmosphere will always try to obtain equilibrium between the water and air. As the amount of carbon dioxide has increased with a decrease of carbon dioxide sponges such as vast land covered by forests, the waterways and oceans are now soaking up the excess carbon dioxide in an attempt to reach equilibrium. This increase in carbon dioxide in the water is creating a more acidic ocean, dropping the pH levels. As the pH levels drop, life forms such as crustacean and coral will no longer be able to maintain their shells or form. When the pH of the ocean reached below 8, the calcium carbonate that is the shell or body will no longer maintain a solid form and the life form will die, increasing the amount of decaying material in the waterway and adding to eutrophication. Not only an increase in decaying matter can lead to eutrophication but also point and non-point sources of pollutants. When a waterway is allowed to gain addition there can be a swing in the balance of the system. When a natural system or ecosystem is working in equilibrium then there is little chance of one single organism taking over the system. If this equilibrium is thrown out of balance by an introduction of addition nutrients such as nitrogen via excessive fertilization of aquiculture or excess accumulation of phosphorus and nitrogen from runoff surrounding compost or bedding from factory chicken farms then lower level organisms can exploit the surroundings (B. Champion, personal communication, September 5, 2012). A bloom of algae can completely destroy the native organisms in any water way by reducing the amount of dissolved oxygen in the water. The lower level life forms such as algae will soak up the excess nutrients, gaining an advantage to out compete the other higher life forms in the waterway thus causing effects such as blocking out light from entering into the water, removing major amounts of critical nutrients, and reducing the dissolved oxygen to levels that will not allow any aerobic life forms to survive. Whether the excess nutrients are from one single source or many different sources the effect can be the same, a breakdown of the balance and equilibrium in the system. Humans have been able to adapt to these changes and are always working on improving life, however, there needs to be a shift from improving the standard of living to that of improving the standard of the environment. Having the ocean become pH neutral thus losing its ability to produce food for consumption could inevitably cause the demise of the human race. Understanding the problems and the effects of the action humans take on the environment around them is the first step. Learning new ways to cut the pollution and changing the culture of industrialized nations is the second step. Maintaining the balance within the natural world and doing everything possible to not upset the equilibrium will ensure that all future generations of humans are able to thrive and live their own sustainable lifestyle. Correcting the damage and allowing the balance to find itself again is paramount for the survival of the human race. 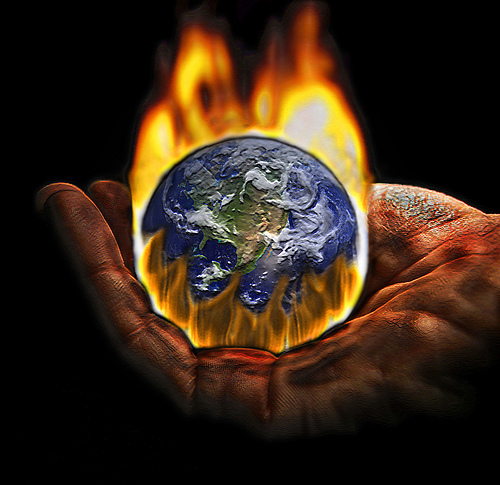 The causes and consequences of global warming have been talked about and debated for some time now. There are many people who don’t think that global warming is a real trend and that it is just something that some scientists got together and thought up. It is an interesting tie that most who feel this way do believe in Immaculate Conception, at least in the American government. From a science standpoint, there are many trends and observations that lead one to think that global warming is actually occurring and that there is some influence to this from humans. Acidification of the oceans and other waterways, acid rain, an increase in CO2 in the atmosphere, trends of warmer weather, increased forest fires, longer and dryer droughts, receding glaciers and the melting of artic ice sheets, and a larger amount of transpiration. The amount of carbon dioxide in the atmosphere will have a direct relation to the amount of carbon dioxide in any given waterway as the gases in the atmosphere will always try to obtain equilibrium between the water and air. As the amount of CO2 has increased with a decrease of CO2 sponges such as vast land covered by forests, the waterways and oceans are now soaking up the excess CO2 in an attempt to reach equilibrium. This increase in carbon dioxide in the water is creating a more acidic ocean, dropping the pH levels. This excess in CO2 as well as other gases, like sulfur oxides and nitrogen oxides, has led to the normally clean rain waters to now become slightly acidic. Nitric acid and sulfuric acid are the resulting compounds that are now precipitating from the once almost pure waters in the sky. All of these gases are greenhouse gases and have the ability to capture energy from the sun in the form of heat. This increase in captured heat is also slowly raising the temperature of the planet. As the temperatures rise across the globe, there are now more forest fires and droughts. In South America, NASA was able to track fires over many years and show that as the temperatures rise there is a direct correlation between those temperatures and the amount of fires during a given year. In Colorado, there have seen studies that show, although this year has been wetter than normal, the amount of transpiration is greater, meaning that although we are receiving more water to the ground, we are also losing more water to the atmosphere. Thus soils are drier and there is an increased chance of damage from drought.